The Cumberland & Dumfriesshire Farmers Mart P.L.C. 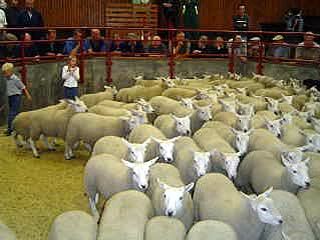 had forward 1,318 store hoggs & 592 ewes with lambs at their weekly sale at Longtown on Tuesday 20th April 2010. Store hoggs were a good show for numbers and sold at recent high rates to the usual ring of buyers. The sale was topped at £93, £92 and £86.50 for Texels from Glencartholm; Suffolk £78.80 Cranshaws, £75.50 Riggshield; Kerry £69.50 Riggshield; Greyface £67.50 Cranshaws, £57.50 Riggshield; Woodland £66.50 Riggshield; Beltex £65.50 Riggshield; Charollais £62.50 Draniegower; North Country Cheviot £59.50, £46.50 East Murton; Hill Cheviot £55.50 Commonside; Blackface £54.20 Haystown, £52.50 Townfoot, £52.20 Haystown; Jacob £42.80 Wester Deans. Feeding ewes to £136.50 for Suffolks from Lintlaw; Greyface £94.50 Lintlaw. A larger show of ewes with lambs at foot sold to a full ring of buyers and met a strong trade throughout. Ewes with twins sold to a top price of £59 for Greyfaces from Henrys Hill, others £57.50 Drumcork and £54.50 How Farm; Texel £58.50 How Farm, £53.50 East Middle; Charollais £54.50 Rigghead; Cheviot Mule £48.50 Pennine View; North Country Cheviot £47 East Middle. Ewes with singles to £58.50 for Texels from How Farm and Greyfaces from East Middle, other Texels £55 Pennine View and other Greyfaces £55 Bateyshield; Charollais £54.50 Rigghead. Greyface shearlings with singles to £58 Pennine View. Texel shearlings with twins to £55 Pennine View.